BANGI, 20 Mar 2014 – The National University of Malaysia (UKM) has been praised by a Climate Change scientist for its contribution to help reduce the emission of greenhouse gases under the Kyoto Protocol. Climate Change researcher Dr Gary W Theseira said UKM’s collaboration with the Sime Darby Foundation (YSD) for sustainable development of zero waste technology for the palm oil industry has attracted worldwide attention. Dr Theseira, who is a Deputy Under Secretary at the Natural Resources and Environment Ministry, made a convincing evaluation in his Public Lecture at UKM today on The International Politics of Climate Change. 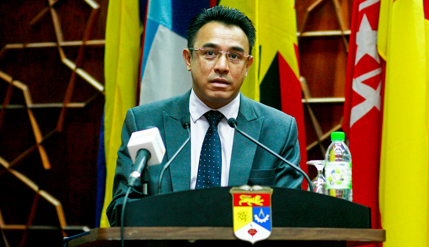 He said Malaysia is also contributing to environmental research through UKM’s Climatology and Oceanography expert, Prof Fredolin Tanggang, who is the Vice-Chairman of the Inter-governmental Panel on Climate Change (IPCC) Work Group 1. On the whole, he believed that Malaysia made significant tangible inputs to sustainable development even though like other developing nations, it has no binding targets under the Kyoto Protocol of reducing greenhouse gas emissions. Under the Protocol, emissions of developing countries are allowed to grow in accordance with their development needs. On the other hand, the Kyoto Protocol, which is binding for developed nations, has made little progress because many industrialised countries – including the United States – have yet to comply with the treaty even 17 years after it was first mooted. Dr Theseira, an articulate spokesman for Malaysia’s contribution to Climate Change research on the international stage, said Canada, one of the world’s biggest oil producers, would not sign the Kyoto protocol; the US did not ratify it, nor did Australia, one of the world’s top coal producers. China, India and the rest of the developing world are not covered by the Kyoto Protocol; and its limits lasted only until 2012 although renewed in 2013. He reasoned that it would be difficult to convince third world countries to do more to reduce emissions if the industrialised nations themselves are not good role models. However, Malaysia has programmes for sustainable development for forestry and the use of renewable energy such as solar energy and hydrogen fuel cell conducted by its various universities and government agencies. Dr Theseira was seconded from the Forest Research Institute of Malaysia (FRIM) to the Natural Resources and Environment Ministry to analyse policies, development and support for environment management, climate change and sustainable development. Apart from the reluctance of the major industrialised countries to comply with the protocol, but they conveniently insist in linking unrelated issues such as trade and human rights when they are asked to fulfil their end of the bargain. He described Climate Change and Global Warming, as one of the most serious environmental threats of the 21st century. It is the only global environmental problem that receives the attention of heads of states and governments and has been on the agenda for nearly all the G-8 industrialised nations meetings in recent years. Present at the lecture was UKM Climate Change Director Prof Dato’ Dr Sharifah Mastura Syed Abdullah, who gave the introduction for Dr Theseira after the opening remarks by Deputy Vice-Chancellor (Industry and Community Partnership) Prof Dato’ Dr Saran Kaur Gill.